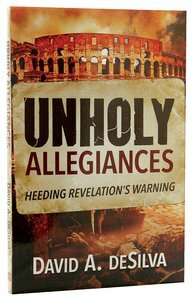 About "Unholy Allegiances: Heeding Revelation's Warning"
David A. deSilva (PhD., Emory University) is Distinguished' Professor of New Testament and Greek at Ashland Theological Seminary in Ashland, Ohio. He is the author of numerous books including 4 Maccabees (Septuagint Commentary Series); the forthcoming 1 Peter (Rhetoric of Religious Antiquity Series), II Corinthians (New Covenant Commentary), Galatians (New International Commentary on the New Testament), Jude (Paideia Commentaries on the New Testament), Revelation (Socio-Rhetorical Commentaries), An Introduction to the New Testament: Contexts, Methods & Ministry Formation; Introducing the Apocrypha: Context, Message and Significance; New Testament Themes; Perseverance in Gratitude: A Socio-Rhetorical Commentary on the Epistle to the Hebrews; Honour, Patronage, Kinship and Purity: Unlocking New Testament Culture, and The Hope of Glory: Honour Discourse and New Testament Interpretation. He holds ordination in the Florida Conference of the United Methodist Church.